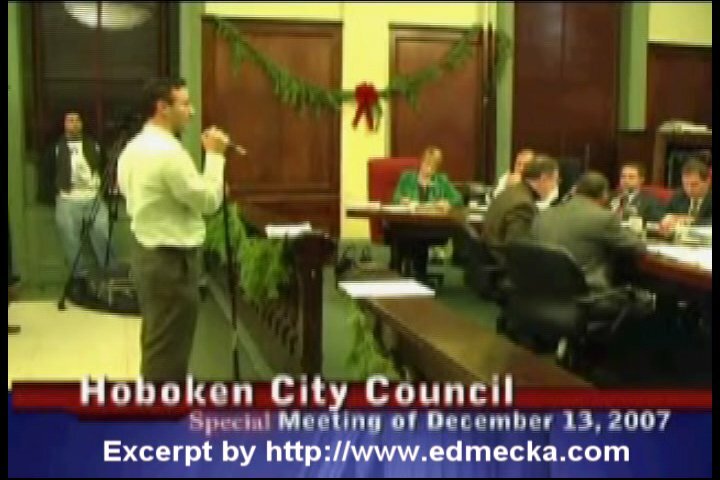 Resident activist Maurice "Mo" DeGennaro, who is a frequent critic of the current administration, is a co-plaintiff in the suit against Hoboken, having repeatedly voiced his opposition to the process at public meetings in the past. Last year, Mayor David Roberts offered to pay DeGennaro a dollar for him to be an advisor to the city, but the gesture apparently didn't buy DeGennaro's loyalty. When asked for a reaction to the lawsuit last week, Roberts said it was "no surprise." "Does it surprise me that a developer who was not successful in an open bidding process is now suing the city?" asked Roberts. "People try to use a lawsuit or the threat of a lawsuit to influence others and sway opinions. In this matter, we have no choice but to defend ourselves and the city's position." Similarly, attorney Douglas Cohen, who represents S. Hekemian, the chosen developer for the land, expressed confidence in his client's position. "We think it's without merit," he said regarding the suit. "We think the process was fair and legal, and we look forward to defending against the lawsuit in partnership with the city." MDK's attorney, Dennis Oury, could not be reached for comment last week. According to Corporation Counsel Steven Kleinman, if the city wins the lawsuit, which he expects it will, the development process will not be stalled. However, if the judge sides with the plaintiff, the city could be required to submit another Request for Proposals (RFP), which could stall the process further. If the city cannot collect some of the development money in time for the currently-proposed 2007-2008 budget, the city will have a gaping budget hole to fill, seven months into the fiscal year. Several years ago, when that happened, the city eventually shut down government for two days because it could not pay the workers. Another option to deal with the $4 million gap is to raise taxes, or to absorb the $4 million debt in next year's budget. The city intends to get a total of $25.5 million for the 1.1-acre parcel of land located at Willow Avenue and Observer Highway, and $4 million has already been allocated to the 2007-2008 fiscal year budget. The remainder of the money will be used to pay $13.8 million in debt that the city accrued by having previously borrowed against the site to fill prior budget gaps. The city actually sold the land to a county agency several years ago, then rented it back for an annual amount equal to the interest on the HCIA's bond, which amounted to about $250,000. Currently, the site is owned by NW Financial Group, which leases the property to the city at a $100,000-per-month fee, so that the municipality can continue to use its only municipal garage. The remaining $8 million or so will be put towards relocating the garage to another spot in Hoboken, according to Business Administrator Richard England. However, the city has to find a place first. According to the lawsuit, the city not only violated the Local Redevelopment and Housing Law with its actions taken during the bidding process, but also deprived Hoboken taxpayers of the benefits of an unfettered competition between bidding entities. In the complaint, MDK cites several actions taken by the city prior to the City Council's Dec. 13 decision to designate S. Hekemian as the redeveloper for the site. The first is the city's decision to give each developer a choice of bidding on either of two configurations to use when building. According to MDK, this is contrary to standard public bidding practices. According to the lawsuit, the city's May 2006 RFP permitted the buildings' height to be seven stories along Newark Street and nine stories along Observer Highway. This configuration was recommended by a resident committee and approved by the Planning Board. As an alternative, developers could bid to build up to 12 stories along Observer Highway and eight stories along Newark Street, with a 10-story height toward the center of the block. MDK also raised concerns about the city's decision to limit the purchase price offer for an alternate proposal to $25.5 million, which MDK claims deprived Hoboken taxpayers of significant revenues that could have been obtained if other alternate bids were considered. MDK had previously submitted its own bid of $30.1 million, which it claimed had conformed to the 12-10-8 configuration. Members of both the City Council and public have contested MDK's assertion, pointing out that the $30.1 million proposal offered by MDK was in reality for a much larger building than 12 stories. MDK's proposal exceeded 140 feet in height, even though it consisted of 12 floors. A story is usually 10 feet in height. In addition, MDK had included a hotel option as part of the bid, which was not included in the RFP. In the past, MDK defended its decision to include the hotel option by saying that the RFP asked developers to be "creative," which MDK argues it was being. Another complaint cited in the lawsuit was the city's requirement that bidding developers agree to advance the $2.55 million, or 10 percent of the approved $25.5 million alternate bid, as a security deposit. According to the suit, a section of the Local Public Contract Law prevents a bid for security from exceeding $20,000. As a result, the city's required security is "more than 127 times that envisioned by the Local Public Contracts Law." When asked to respond to this particular claim by MDK's attorney, Corporation Counsel Steven Kleinman said that in legal principle it's accurate, but the process the city undertook was not connected with the Local Public Contracts Law. Instead, he said, it's connected to the local redevelopment law. Resident Maurice DeGennaro said that initially he wanted to file his own lawsuit against the city. But he was advised by his attorney to file a joint suit with MDK against Hoboken and S. Hekemian. "They could have gotten more money," DeGennaro said. "They screwed up, limiting bidders to a fixed amount. What were they thinking? They did this to appease a small group of politically-active people. And in the process they wasted our time and money. We should throw out the bids and see what we can get for this land." DeGennaro was referring mainly to the Observer Highway Advisory Committee, a 16-member body which was appointed by the mayor to be a voice for the community in the process. DeGennaro added that he believed the committee was primarily comprised of residents who lived near the garage, and therefore they may have possessed a bias against tall buildings, not giving consideration to the amount of revenue the site could generate for the city. In response to DeGennaro's assertions, Lane Bajardi, who headed the committee and lives near the site, said that five of the six city wards were represented on the committee, with the 4th Ward not having a representative. Bajardi added that to suggest a 12-story building appeases a community group is "pretty ridiculous, but we accepted the outcome of the open bid process." In response to the lawsuit itself, Bajardi said, "It is a shame that instead of participating in a fair and open bidding process, one developer has chosen instead to sue the taxpayers of Hoboken." Bajardi added, "With all due respect to Mr. DeGennaro, I would remind the public that he is a high-rise apartment building developer interested in building more high-rise apartment buildings in Hoboken. That fact is important when attempting to understand his true motivation." DeGennaro has publicly announced his intention to build on a parking lot adjacent to the senior facility Columbian Towers at 76 Bloomfield St., which he manages for the Columbian Towers Board of Directors. Columbian Towers, according to DeGennaro, was an off-shoot of Knights of Columbus 28 years ago. In response to Bajardi's claim, DeGenarro said that yes, he's looking to build more subsidized housing for seniors, but it was not his motivation to file the lawsuit. He said he filed it to "reclaim money that the city lost." Here is a Hoboken Special City Council Meeting excerpt dated December 13th, 2007 featuring the comments of HANY AHMED with respect to the Municipal Garage bidding process.